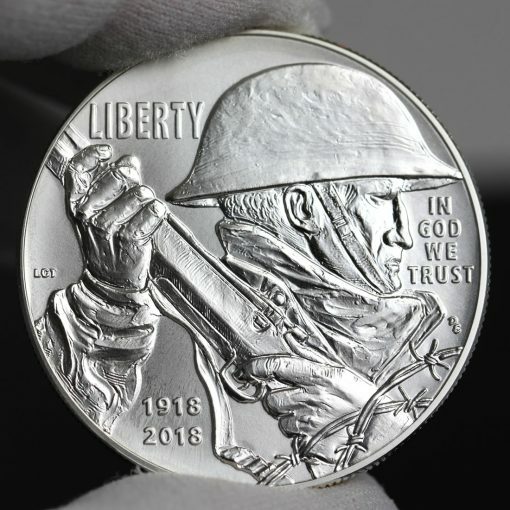 This article presents photos of World War I Centennial Silver Dollars, the U.S. Mint collector coins commemorating the 100th anniversary of America’s involvement in the First World War. 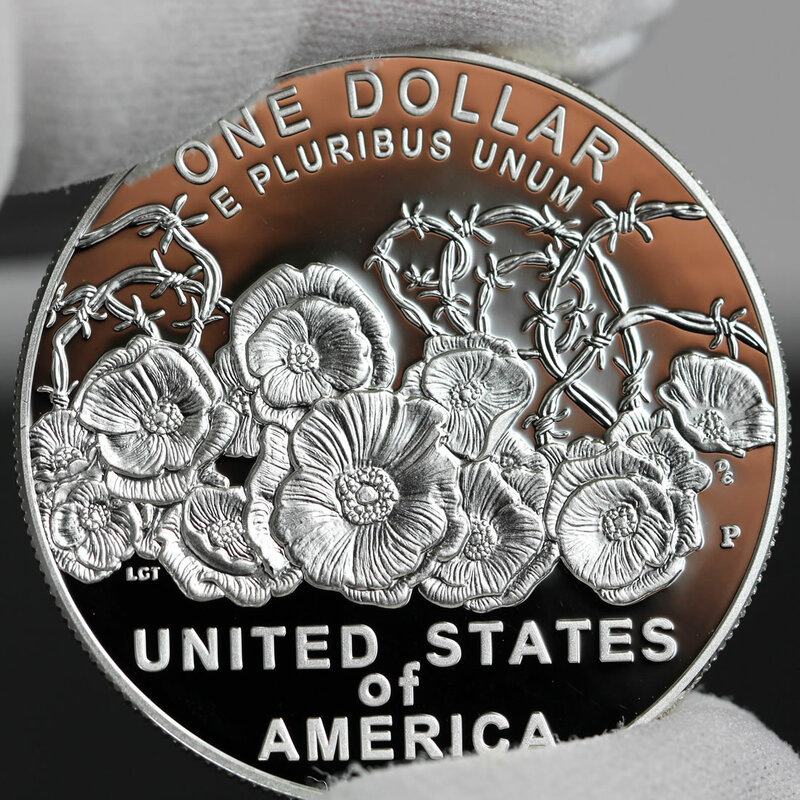 Released on Jan. 17, the collectibles are produced at the Philadelphia Mint in finishes of proof and uncirculated. 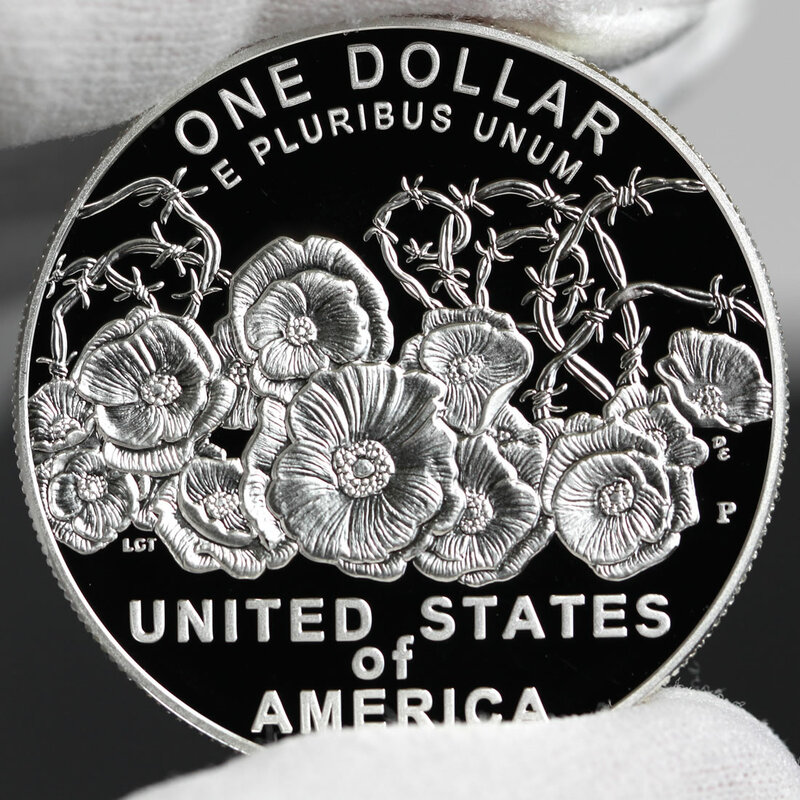 Proof coins have frosted designs that contrast attractively against mirror-like backgrounds. They are almost aways more sought than uncirculated coins which have a brilliant but more standard appearance. The following sets of photos show both coin types. 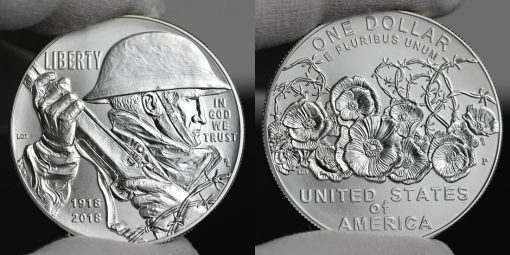 In the first photo, a proof WWI Silver Dollar is to the left. You can see its mirrored qualities reflects the red, white and blue colors from its presentation case. CoinNews photos of the obverse and reverse of a proof World War I Centennial 2018 Silver Dollar. The coin’s obverse depicts an almost stone-like soldier gripping a rifle. Barbed wire twines are featured in the lower right-hand side of the design. 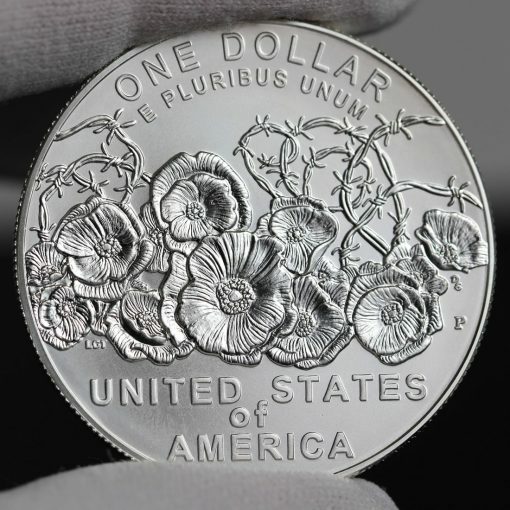 The wire design element continues onto the reverse, which also features abstract poppies mixed in with barbed wire. The designs resulted from a judged competition won by LeRoy Transfield. Don Everhart sculpted the designs. 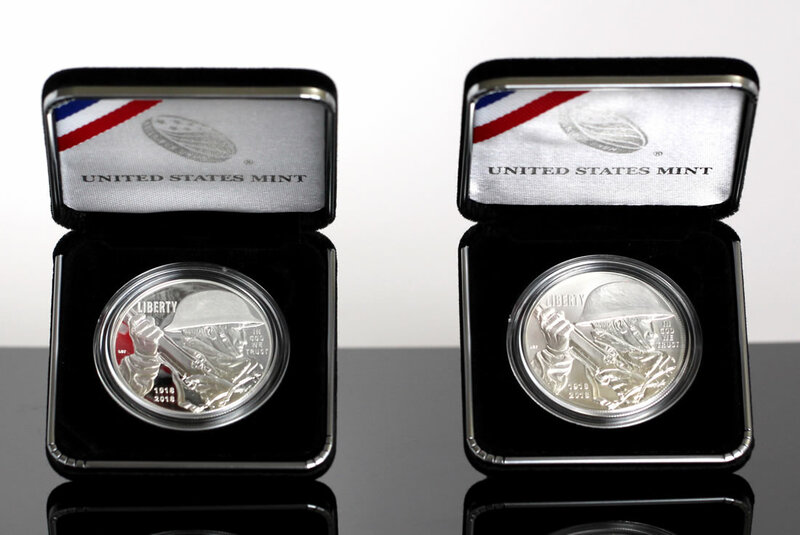 Both dollars ship in similar commemorative packaging. 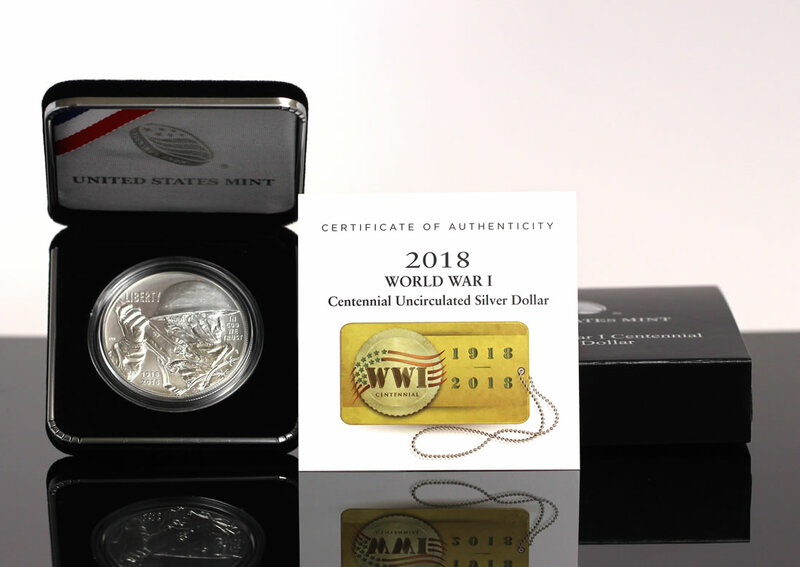 They arrive boxed, are held in a black-velvet presentation case, and are accompanied by a U.S. Mint Certificate of Authenticity. Available at discounted introductory prices until 3:00 p.m. ET on Feb. 20, with the proof $51.95 and the uncirculated $48.95, place orders using the U.S. Mint’s online commemorative page. Regular prices are $5 higher. Honoring the Army, the Navy, the Air Service, the Marines and the Coast Guard, five companion WWI silver medals are sold alongside the silver dollars. 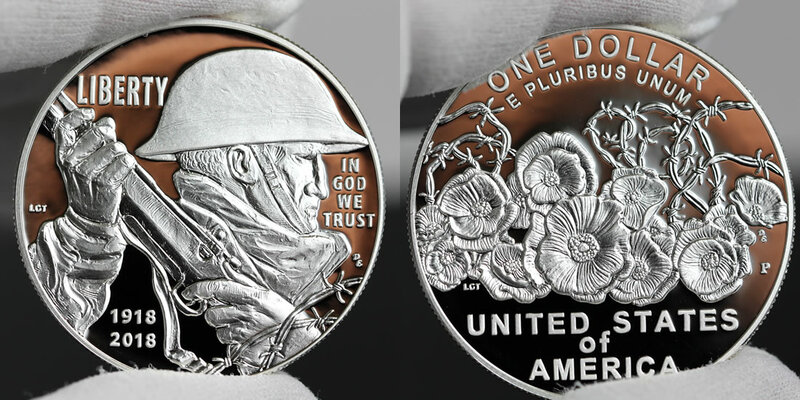 Each of the five medals is sold in a set with a proof WWI Silver Dollar. The medals/sets go off-sale after 3:00 p.m. ET on Feb. 20. 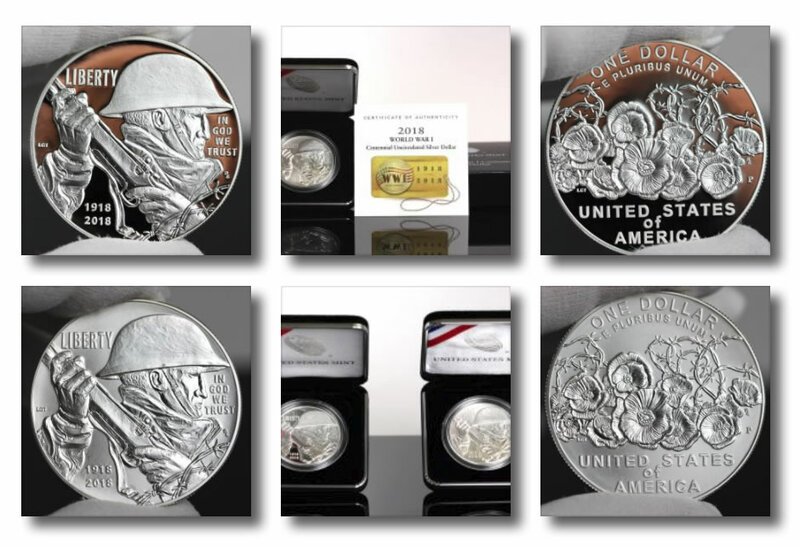 I always find myself having a hard time deciding if I like the glossier finish of the proof or the naturalistic tone of the uncirculated; each has its own unique appeal. 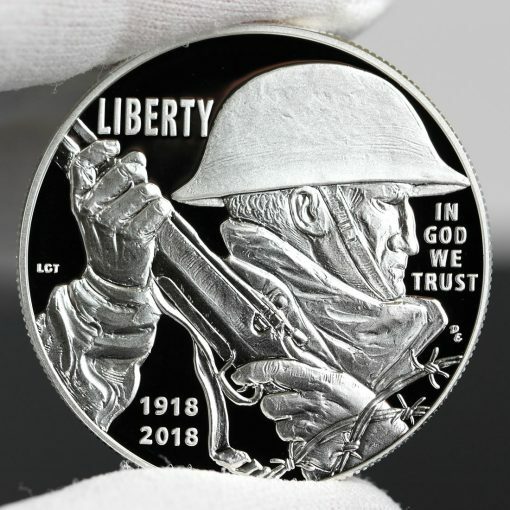 The detail on these coins = amazing. I feel the same way Old Collector. Both platforms have their unique qualities. 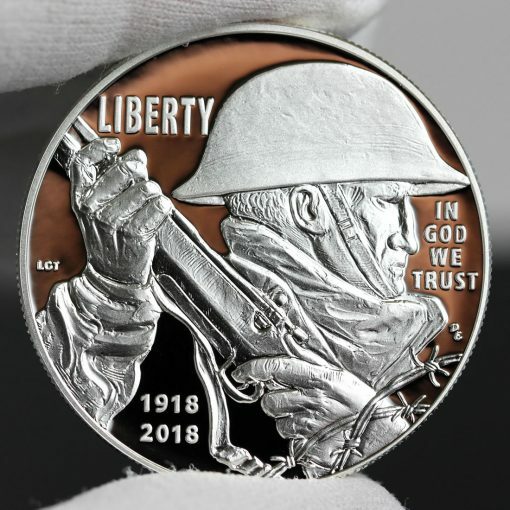 Well the WWI medal sales have ended. Let the dust settle and see the final sales count. It can only go down from here….. Beyond the funky ergonomics of the lefty advance….the self portrait of the designer…..where is the rest of his body, heads & hands it seems…. I am just Debby Downer on this issue!!! Oh and there is this….IU.S. Entry into World War I, 1917. NOT 1918!??? JFK !ooth is in 2019 did you see the USM changed his birthday!!! The coin is to commemorate the US contribution to the end of the war – not the entry. My best guess regarding the date on the coin would be that it refers not to the year of the United States of America’s entry into World War I but rather the date of the declaration of cessation of all hostilities, which was November 11, 1918. 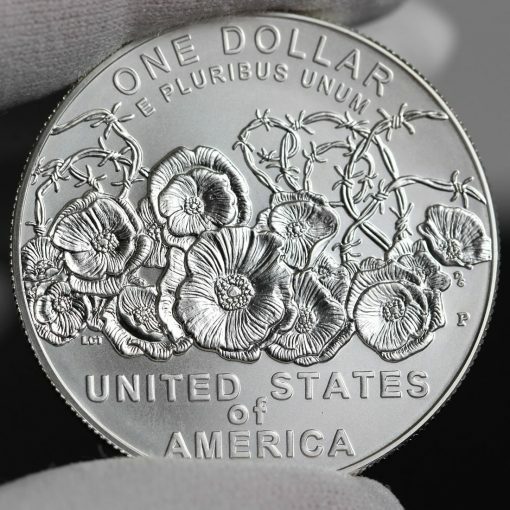 Hence, the 1918-2018 inscription on this silver dollar. 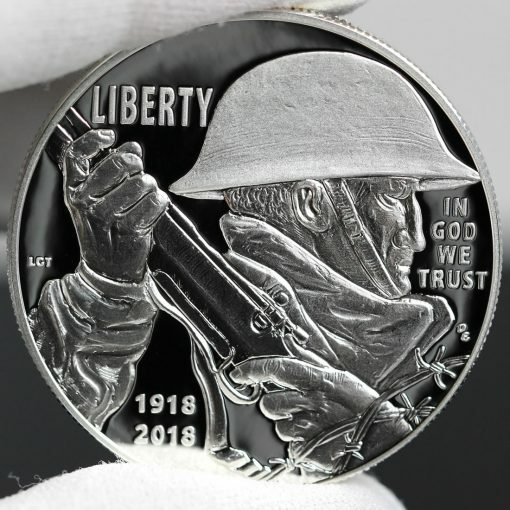 Indeed, if this coin had been intended instead to commemorate the 100th anniversary of America’s entry into the war, its release would have been sometime late last year and the inscription would then have read 1917-2017. Thanks again for sharing your always great high res photographs with us fellow collectors! 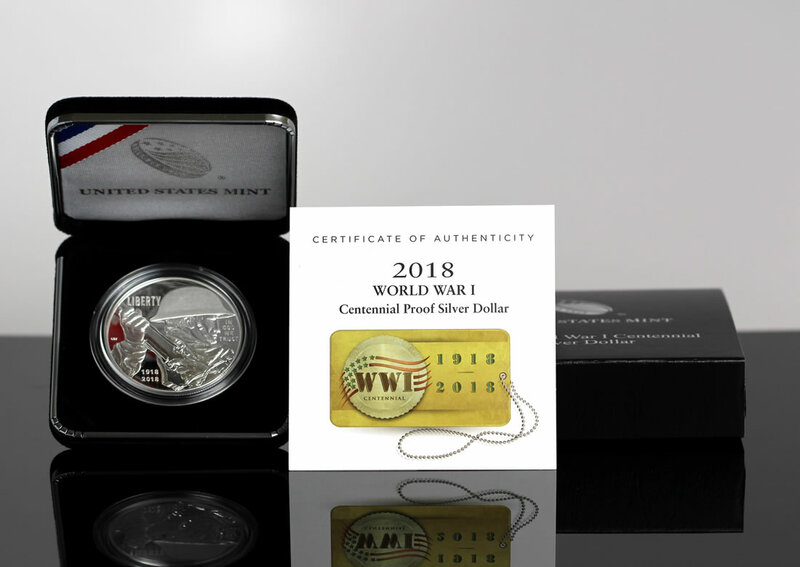 The virtual World-Wide Web Mint will any day now begin accepting virtual design submissions for its upcoming series of WWII virtual commemoratives. Start saving your virtual dollars for this big virtual event! I concur…the Jim Thorpe dollar is not just very well designed but also brilliantly evocative of his outstanding athletic attributes. Chas – read the act. It literally says in there to make it in 2018 and put 2018 on it. So, the legislation told the Mint what to do. I’m failing to see why you are so angry at the price being asked. 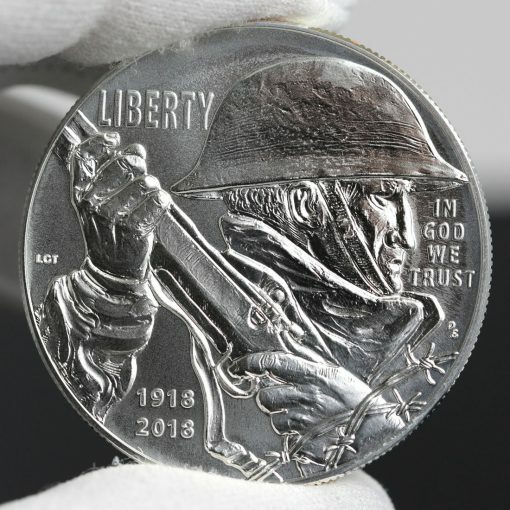 No one is forcing you to buy a centenary medal, so don’t let it get to you. Thanks for providing that link. The Act makes for very enlightening reading, especially as a way of learning how explicitly it covers every single factor involved in producing the coin, including any possible variables. They (the Congress) certainly do manage to have every base covered, don’t they? Your illumination regarding the nature of your wife’s hobby has given me pause and urged me to reflect on whether or not my Wolfgang Amadeus Mozart Rubber Ducky collection is in fact a good investment of my time and money. Ach du lieber! By the way, there really IS exactly such a product line of rubber ducks on sale in the gift shop of the Mozart House & Museum in Salzburg, Austria!